Harry Potter and the Deathly Hallows is in theaters today!! 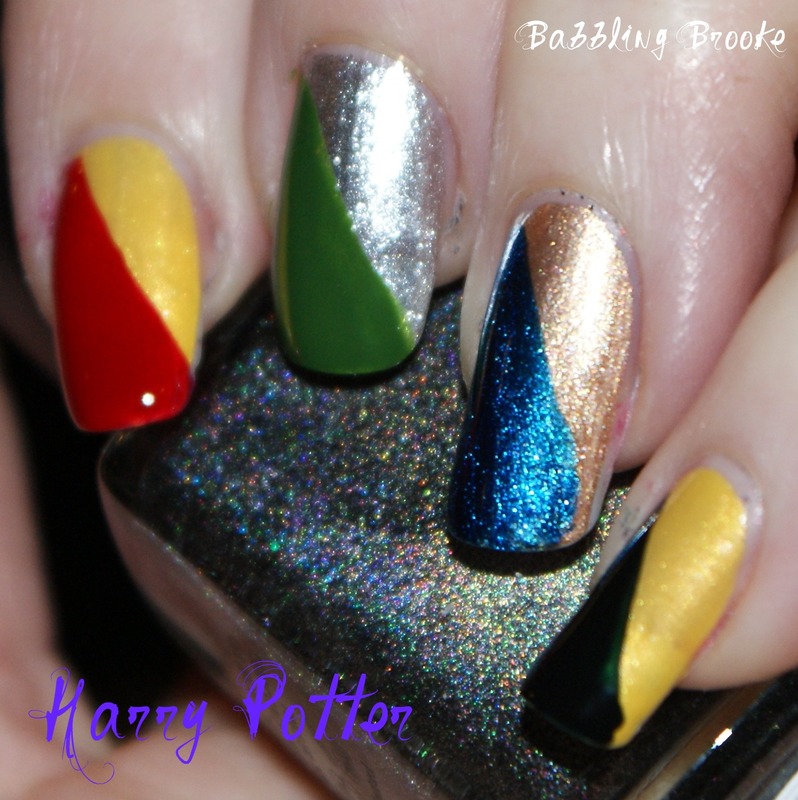 To share the excitement, I have my final Harry Potter manicure featuring all of the house colors. These are my Gryffindor, Slytherin, Ravenclaw, and Hufflepuff House Flags. Are you seeing Harry Potter tonight (or have you already seen it)? I hope everyone is having a nice Friday! I watched the first movie years ago and that is it. But your nails look great! I probably won't see it this weekend either - I'm not into waiting in long lines and hanging out in a crowd for hours - but I'm still feeling the HP spirit this weekend! I probably won't get to see HP until after the holidays - just too much stuffs going on! I love this one - especially Huffelpuff! I was gonna say....Quidditch time cause of the flags! I love the flags translated into nail art. I am going to a matinee on Monday in an out of the way theatre. I'll have to think up a way to accessorize my nails for the afternoon. Do you like it?? I was inspired from your Harry Potter Week and I'm going to rock it tonight for the movie!! Saw it, loved it. Love your designs! I saw it last night. My best friend and I bought the tickets on Wednesday. We didn't have to wait in any lines though. It snowed here so it took us longer to get to the theater. We got there right when the previews were starting. I can't believe the number of people waiting in line in the snow for the next showing.